Finally after seeing many different projects with this trendy technique, I had the chance to make my very own! As my project included a quote rather than an image, I’ve decided to mix the colours instead of doing a rainbow rain as the majority of the pictures I’ve found have. First break the crayons in little pieces that you are going to “spread” all over the canvas. Crayons are wax, so you don’t need to cover every single space, when it melts it will expand. I have placed them around 4-5 cm apart from each other. But it will depend of the number of crayons and the size of the canvas. I was also aware that putting the crayons too close would potentially led to “over” mixing the colours and end up with an odd tone, so I preferred to be more in control of that. Once you’ve decided where you are going to place the crayons, you should use hot glue to fix them to the canvas. Otherwise when the hair drier is on, they will fly away. Try to use only a tiny bit, enough to fix them but not too much that will add extra (unwanted) texture. I’ve followed this tutorial to guide me, though is a different project. I didn’t use any sponges as I did not want to mix the colours that much. Once everything is ready, turn the hair drier on and focus it in a section at a time. It will take a while to melt (depending on it’s power) but once it’s ready, it’ll be almost like water and you can play and direct the flow of the colour as you please. Once you’ve covered the whole canvas, let it dry! it wont take long. 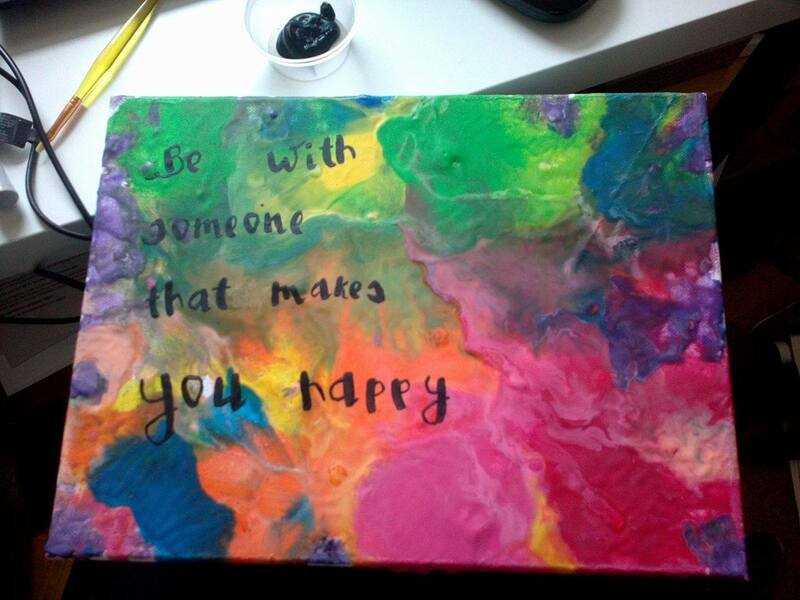 In this project, I wanted to write a quote with acrylic paint. I wasn’t sure if it was going to be a problem to paint on top of wax. I’m not particularly good at painting nor handling a brush and I’m quite perfectionist, so it took me some time to draw the letters first and then colour them carefully. At the end the letters could have been slightly bigger, but well, I was afraid I would ran out of space. To highlight the letters (as I didn’t have white paint) I’ve used correction fluid and a toothpick to draw the lines. 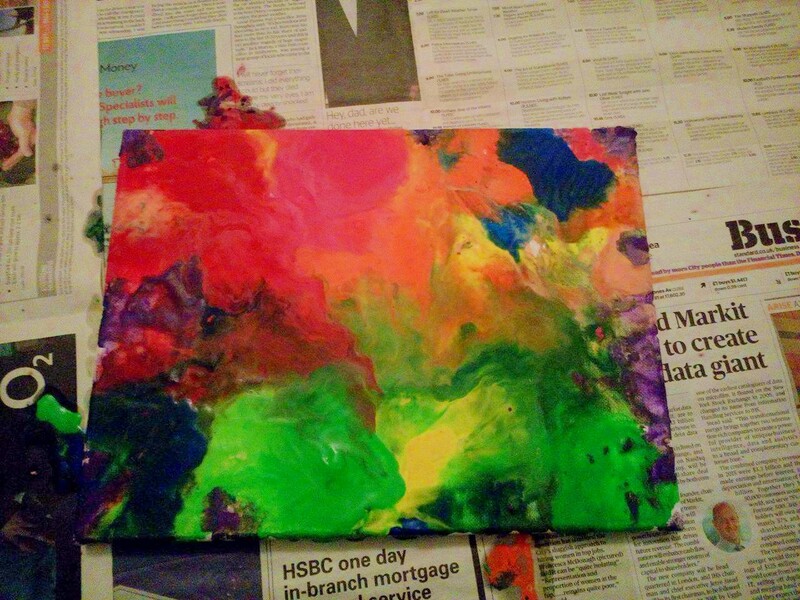 It was easier to handle it as paint, I thought it was going to dry in the middle of it.